Update 22 April 2012: Financial contributions are no longer required, enough was raised, and the Dawn is now online. If you wish to support similar projects, tax deductible contributions can be made by donating to the Australian Women's Archive Project at the National Foundation for Australian Women. Improve Louisa Lawson's bio on wikipedia, and the wikipedia page on The Dawn itself. 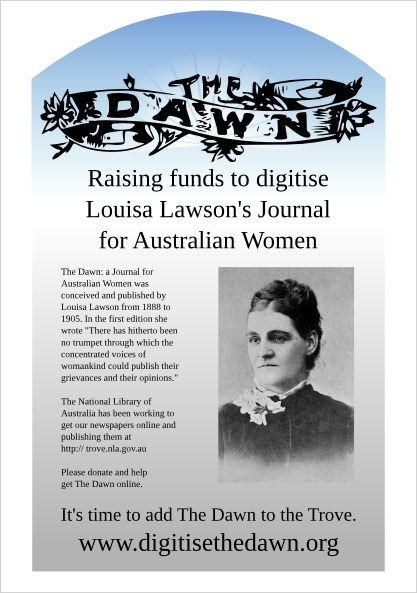 Blog about the campaign, about Louisa Lawson, and about The Dawn - and post a comment here to let us know. And I intend to do another one focusing more on the Digitisation project yet, too, I'll let you know!